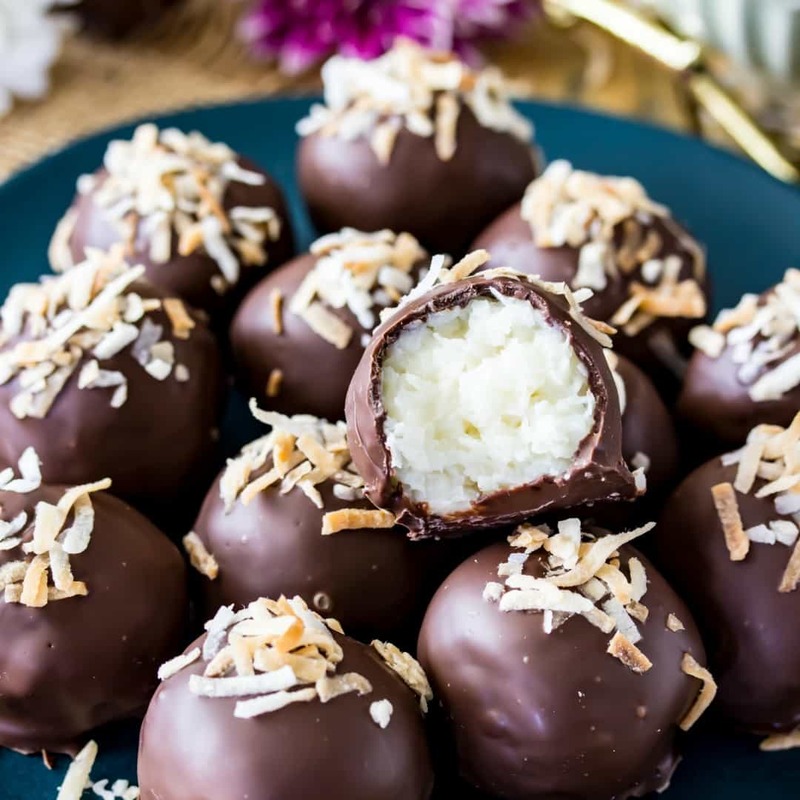 Sweet Coconut Cream Truffles made with just a few ingredients, cloaked in a dark chocolate shell, and topped off with toasted coconut! I have a feeling that you’ve probably noticed this on your own, but just in case you haven’t, consider this your official notice that summer is here. For me, that means recently I’ve been inclined to reach for more refreshing, slightly tropical flavors, like key lime pie, pineapple upside down cake, and anything containing coconut. I’ve also been about 0% interested in turning on the oven at all if I can help it, so when I set about developing a dessert recipe for you this month, a no-bake coconut treat was a no-brainer. 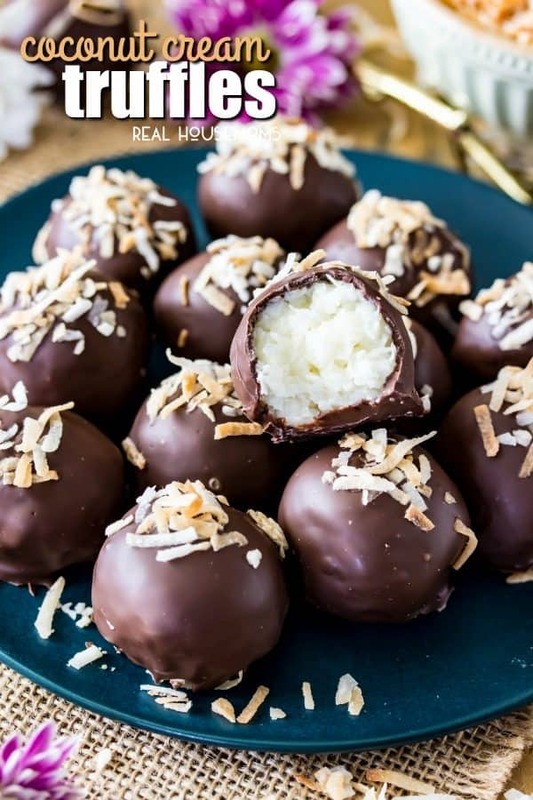 Another reason that I love these coconut cream truffles is that that unlike many other candy recipes, these are so simple to make. 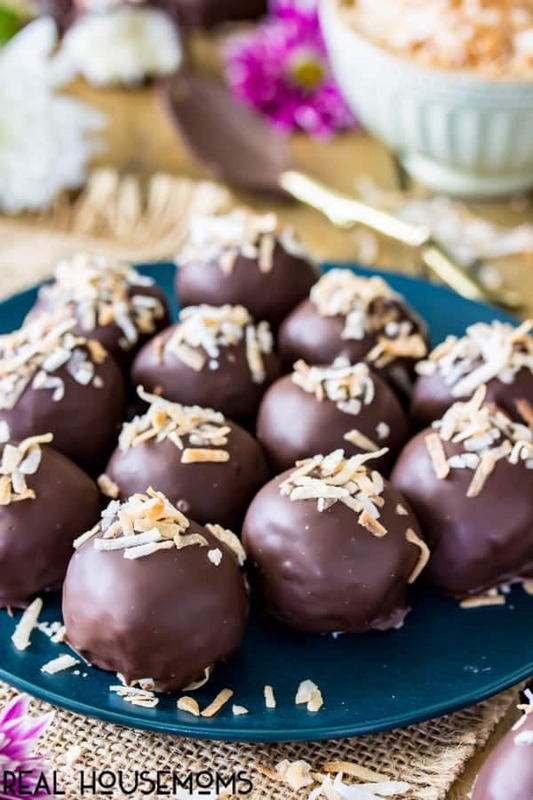 My go-to confectionery recipe is usually my Millionaire’s Shortbread, but these coconut cream truffles are just as delicious and take a fraction of the time, which makes them a winner in my book! These coconut cream truffles use only a handful of ingredients and take only a few minutes to make (plus a little bit of chill time, but you’re not going to want to skip that as it makes the whole process a lot easier and cleaner on your part!). A dark chocolate shell is a semi sweet compliment to the sweet, creamy interior. 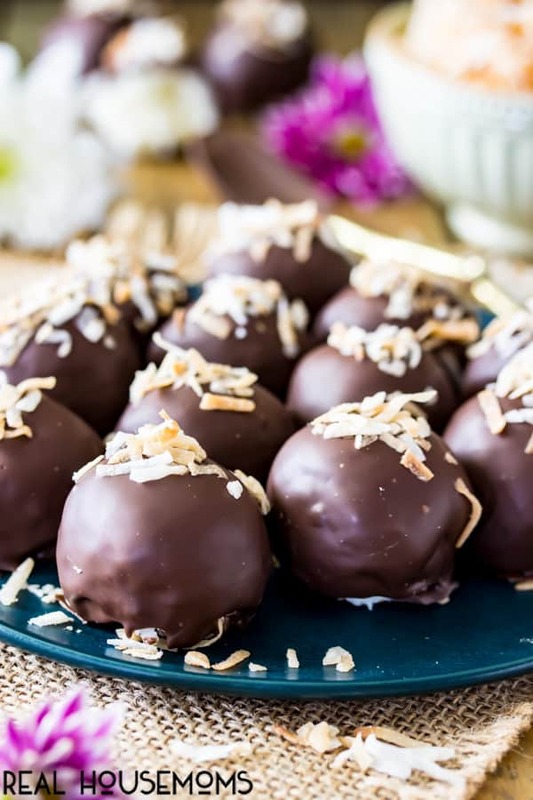 You’ll use sweetened, shredded coconut to make the centers of these truffles, but first I recommend briefly pulsing the coconut in a food processor so that the interiors are less stringy (without losing that signature coconut texture). Make sure to reserve a handful of coconut flakes to lightly toast in the oven for a pretty topping to your truffles! Place coconut in food processor and pulse repeatedly until coconut is fine and not stringy. Set aside. In a separate, large bowl, stir together condensed milk, melted butter, vanilla extract, and coconut extract (if using). Pour in coconut and stir well. Place bowl in refrigerator and chill at least 15 minutes. Remove from refrigerator and roll into 1 1/2 Tablespoon-sized balls (if the filling is too sticky, return to fridge for an additional 10 minutes to chill). Place on wax-paper lined cookie sheet, repeating until all filling is rolled. Place cookie sheet in the freezer for 10 minutes. Prepare melting wafers according to instructions on package. Dip chilled coconut truffles into dark chocolate, return to wax paper lined cookie sheet and allow chocolate to harden before serving. If topping with sprinkles or toasted coconut, be sure to add before chocolate hardens. Keep uneaten truffles refrigerated in airtight container. It calls for14 ounces of coconut? How much is that in cups?